The first production Mirage IIIE was delivered to the AdA in January 1964, and a total of 192 were eventually delivered to that service. Total production of the Mirage IIIE, including exports, was substantially larger than that of the Mirage IIIC, including exports, totaling 523 aircraft. In the mid-1960s one Mirage IIIE was fitted with the improved SNECMA Atar 09K-6 turbojet for trials, and given the confusing designation of Mirage IIIC2. Most Mirage IIIE aircraft are now gone from the world's air forces though some are still plying the skies from time to time after having undergone various upgrades. 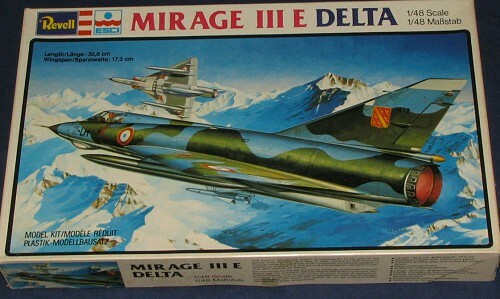 One of the things that ESCI produced was a very nice Mirage IIIE. Now some will claim that the kit has shape problems, but since I'm not a plans person, I can only say that when you get finished with the kit, you have a very nice model that looks quite like what it is supposed to be. ESCI produced this kit in a number of different boxings, each with different decals and at times, with different parts. This particular Revell Boxing seems to be the standard version, kit # 4030. Molded in grey plastic with finely done raised panel lines, this particular boxing is free of flash and though it does suffer a bit from ejector pin marks, most of them seem easily removed. There is detail in the wheel wells and inner gear doors though this is a bit thick and so you'll find large sink areas on the outside of the main gear outer doors. I also found some rather hefty sink areas opposite ejector towers in the fuselage nose area. The interior consists of a cockpit tub, rather generic looking seat and control column. The instrument panel and consoles are smooth and the instruments represented by decals, which makes for a poser in this decal-less kit! Wings have the control surfaces molded in the top half making for a sharp trailing edge. The leading edge of the upper wings show large sink areas that will need filled. The elevon actuators are separate as are the various fuselage scoops. The exhaust is only really as deep as the afterburner petals so you may want to drill this out, insert some tubing and engine detail. Two high speed drop tanks are provided for the wing pylons and the central pylon contains a Matra missile. Instructions are well done and provide good construction steps and generic paint colors. If I had decals, I'd find markings for four aircraft; one from France, Switzerland, Australia and Spain. Fortunately, there are aftermarket sheet around for this kit so all is not lost. I built this same basic kit in the ESCI box many years ago and found it to be a trouble-free build. It isn't as detailed as a modern kit but when it is done, it will add another interesting model to your collection. 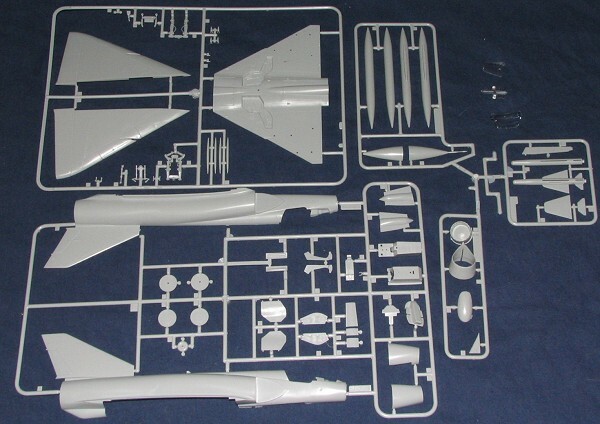 Though there have been rumors of a modern quality Mirage IIIE on the horizon (and perhaps Eduard will do one), that kit has not seen the light of day . This one is very much worth seeking.